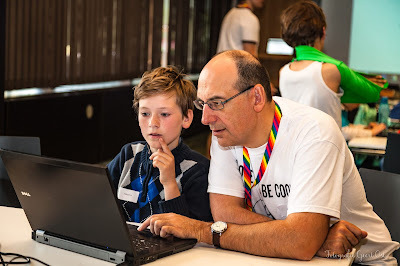 When did you start coaching for CoderDojo? I joined CoderDojo as a ninja in September 2014. At the time, there weren’t any Dojos in my neighborhood so we had to make the trip to Gent. I started coaching in Gent in September 2016. In the meantime, I also visited the Dojos in Dilbeek and Schaarbeek. I was coaching in Halle when I decided to start my own Dojo in my hometown. It’s so cool if you can combine coaching kids with learning something yourself. CoderDojo is way more fun when you are interested in different topics. I attended the CoderDojo bootcamps and learned a lot about how to organise a CoderDojo and how to work with Arduino and Micro:bit. In my opinion, all coaches should get the opportunity to learn something when they are coaching a CoderDojo. It’s so cool if you can combine coaching kids with learning something yourself.